This may be a congressional first. 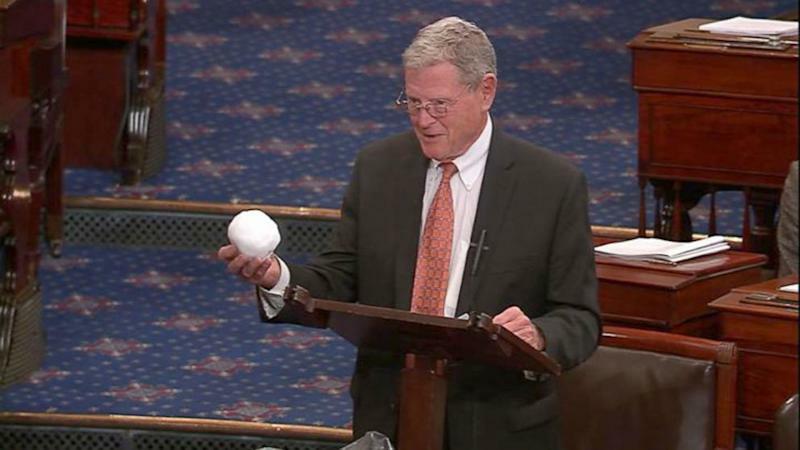 This isn't the first time Inhofe has used snow to make a point about climate change. After a massive snowstorm in the Washington, D.C., area in 2010, Inhofe and his family famously built an igloo and labeled it "Al Gore's New Home." The Environmental Protection Agency's website says, "Rising global average temperature is associated with widespread changes in weather patterns. Scientific studies indicate that extreme weather events such as heat waves and large storms are likely to become more frequent or more intense with human-induced climate change." Speaking on the Senate floor later in the afternoon, Sen. Sheldon Whitehouse, one of the Senate’s strongest environmental advocates, used figures from scientific studies to rebut Inhofe’s theory. “You can believe every single major American scientific society or you can believe the senator with the snowball,” Whitehouse, D-R.I., said.